President Trump says the U.S. immigration system is broken because some undocumented immigrants have their cases heard by judges. The president’s claims seem to be based on several misconceptions about immigration courts, U.S. law and the process of applying for asylum. Let’s unpack. Rampant violence and gang activity in El Salvador, Guatemala and Honduras have prompted hundreds of thousands of children and families to leave their homes and seek refuge in the United States since 2014. U.S. laws provide asylum or refugee status to qualified applicants, but the Trump administration says smugglers and bad actors are exploiting these laws to gain entry. Trump has called on Congress to narrow the scope of these humanitarian-relief laws to close what he describes as “loopholes,” but now he’s saying the United States should stop having judges evaluate immigration cases altogether. Undocumented immigrants should be turned away immediately, Trump says. As a legal question, experts say Trump’s proposition is unsound. The Constitution grants due-process rights not only to U.S. citizens but to every “person” in the United States. The Supreme Court has said this covers undocumented immigrants. A long-standing framework of federal statutes, regulations and court precedents governs how U.S. officials handle asylum claims. Together, these lay out the “process” that asylum seekers are “due” under U.S. law. As long as these laws are on the books, turning away asylum applicants without court proceedings in many cases would be a violation of their due-process rights under U.S. law, experts say. In addition, the United States has agreed to abide by international compacts that extend the right to seek asylum to qualified immigrants, namely the Universal Declaration of Human Rights and the United Nations Protocol Relating to the Status of Refugees. “The Constitution and the immigration laws, other than expedited removal, administrative removal and other limited exceptions, do not provide for deportation without an administrative hearing before an immigration judge. That would violate due process,” said Barbara Hines, who retired as a law professor at the University of Texas School of Law. “Any sort of hasty, non-judicial procedure really deprives these asylum seekers of the opportunity to rely on protections that are afforded to them under our Constitution and the international legal system,” said Laura Lynch, senior policy counsel at the American Immigration Lawyers Association. Trump’s tweets don’t include much context and make it seem as though every undocumented immigrant goes before an immigration judge. That’s not the case. The vast majority of removal orders are “expedited removals” or “reinstatements,” which is shorthand for removing someone who has been ordered out of the United States previously. Both types of proceedings are carried out quickly, without undocumented immigrants appearing before judges, and these orders generally cannot be appealed. In fiscal 2013, expedited removals and reinstatements accounted for 83 percent of all removal orders, according to a study by Jennifer Lee Koh, a professor at Western State College of Law. The rate had climbed to 85 percent by the end of fiscal 2016, Koh told The Fact Checker, citing statistics from the Department of Homeland Security. Under section 235(b) of the Immigration and Nationality Act, an immigrant who has not been admitted or paroled into the United States and who cannot show a continuous presence of at least two years in the country qualifies for expedited removal. Under Trump, the Department of Homeland Security as of February 2017 was pursuing a potential expansion of the types of cases subject to expedited removal. There is, however, an exception. Immigrants from noncontiguous countries who make a claim of “credible fear” upon arrival to the United States are exempt from expedited removal, and their asylum applications are typically heard by immigration judges. This covers Central Americans fleeing their home countries. The Trafficking Victims Protection Reauthorization Act of 2008 separately provides an exemption for unaccompanied Central American children who otherwise might be subjected to expedited removal. The Trump administration says these immigrants should show up at a port of entry along the U.S.-Mexico border and wait their turn to seek asylum. But these entry points are overcrowded, and U.S. law says immigrants may petition for asylum even if they do not show up at a port of entry. For those people who do get an immigration hearing, the process is not as robust as what you might see in other types of U.S. courts, experts say. It’s not clear who told Trump 5,000 judges were needed. But this claim defies logic. The United States had 334 immigration judges as of mid-April, and a top official at the National Association of Immigration Judges says an additional 365 judges would be needed to get through the backlog. A bill by Sen. Ted Cruz (R-Tex.) would increase the total number of judges to 750, not 5,000. As we reported in May, the U.S. judicial branch has nearly 1,300 sitting federal judges. This includes all Article III judges who sit in the district courts, the courts of appeal, the Court of International Trade and the Supreme Court. Immigration judges are not counted toward this total, since they work in the executive branch, inside the Justice Department. But the point is that all the Article III judges, hearing all sorts of federal cases, at all the different levels, number only 1,300 or so — not in the thousands. Finally, it’s worth pointing out that most illegal immigration is the result of people overstaying their visas. The number of asylum claims filed by people who cross the southern border is small by comparison. In fiscal 2016, U.S. officials reported 408,870 southwest border apprehensions, 544,676 visa overstays and 65,218 asylum claims. Taken to their logical extreme, Trump’s tweets call for the wholesale unwinding of U.S. laws on asylum and immigration courts, a move that some experts say would violate both the U.S. Constitution and international agreements on human rights. The president’s tweets lack context and do not take into account that the vast majority of removal orders (85 percent) are issued quickly and without any hearing before a judge. His claim that “thousands” of judges are needed defies logic. 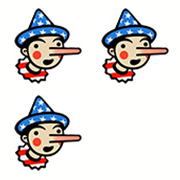 Trump gives a highly distorted account of the U.S. immigration system, and it merits Three Pinocchios.